Aircraft-inspired “nacelles” graced the hood of the attractively restyled 1960 Chevrolet C10, which now relied on independent front suspension (the pickup market's first) sprung by torsion bars instead of coils. Coil springs brought up the rear in place of the leafs installed prior to 1960. Conventional coils replaced the torsion bars up front in 1963, allowing the frame's reinforcing x-member, in place since 1960, to be deleted. 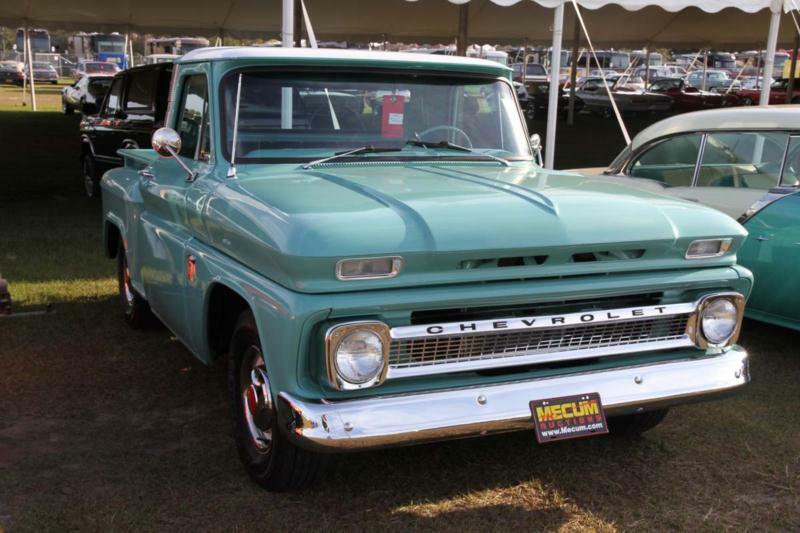 The 1960 model year was the first in which Chevy pickups featured a full-width pickup box as standard equipment. Styling is a hit or miss affair for the earlier years (1960-62), with wrap-around windshields and their unique hoods that are all but impossible to find as replacements. GM discontinued this difficult-to-stamp component for the 1963 model year, even for collision replacement parts, so it’s not unusual to find earlier trucks with the later 1963-66 hoods. Those later years saw styling that was more mainstream looking, and those are generally most sought-out by collectors. Externally, only the trim shuffle games prevalent in Detroit at the time differentiate 1964 through 1966s. Styling updates included a switch back to dual headlights in 1962. The basic body carried over through 1966 but was graced with restyled roof posts in 1964, giving the cab a more rakish appearance. New model designations debuted for 1960, with the former 3100-series half-ton tag traded for a “C10” identification, the “C” being short for “conventional,” or two-wheel-drive. The “K” prefix continued to signify the presence of a four-wheel-drive pickup. Power trains are similar to the previous “Task Force” era trucks, with choices of thrifty-yet-durable inline sixes or small-block V-8s that still work in modern traffic. Especially prized are the final year 1966s with the optional and beloved 327-cid small-block V-8 (even if it is detuned two-barrel best suited for low-end torque rather than a powerhouse Corvette 4-barrel). This era of trucks also saw a greater availability of creature comfort options—especially power steering, power brakes and air conditioning—helping to transition pickups into becoming second cars. The modern specialty aftermarket fully supports this generation of Chevy truck, with reproduction items and regular service parts both easily found in the modern retail parts chain stores, making them especially easy to own.